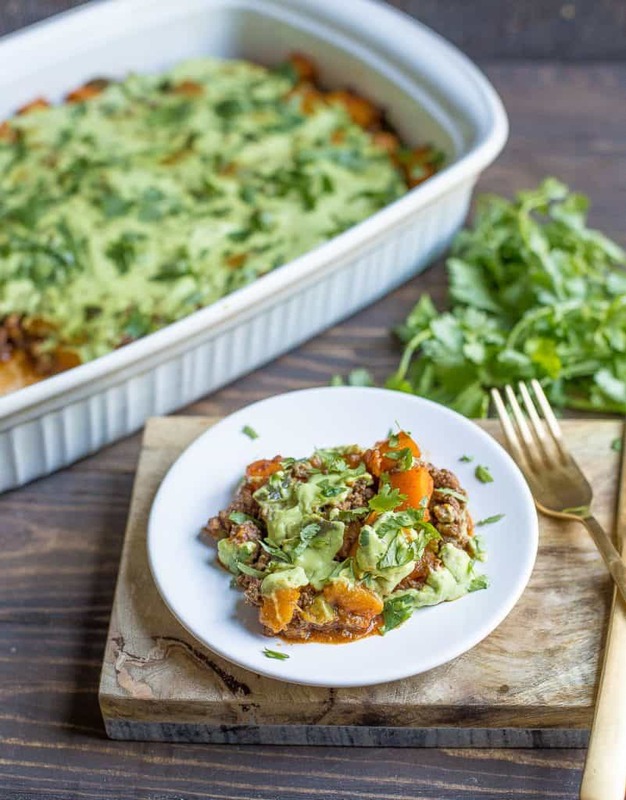 This Beef Enchilada Bake is made without the tortillas for a grain-free and low carb alternative to your favorite Mexican dish! 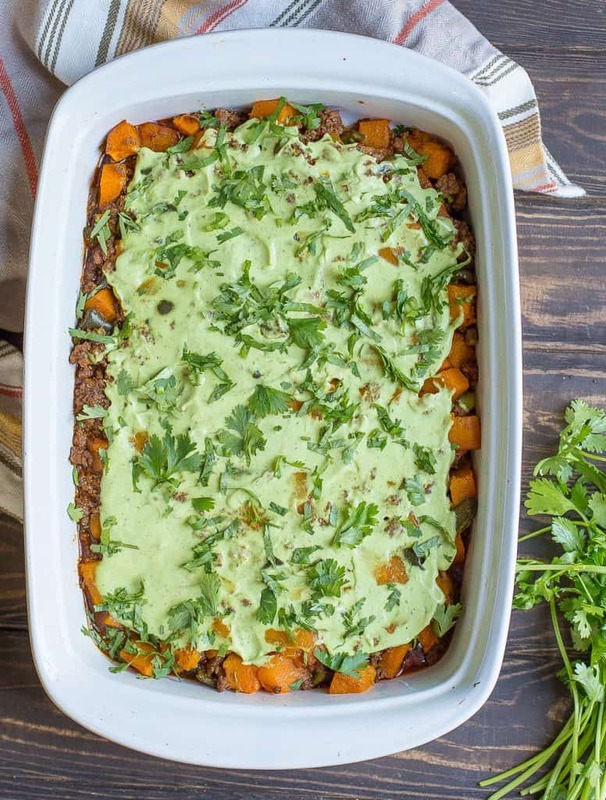 You’ll love the butternut squash, poblano peppers, and most delicious creamy cilantro avocado sauce on top. 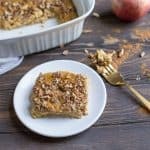 Gluten-Free, Paleo, and Whole30 compliant. If there is one food (besides eggs) I could eat everyday for the rest of my life, it would be enchiladas. You?? Here’s the deal with enchiladas: I can eat them 1000 different ways and always be happy with the results. It’s my “go-to” when I order out at a Mexican restaurant, and I always look for fun and different variations. And while I generally prefer chicken over beef, I do like to change things up from time to time. Take for example, these ridiculously delicious enchiladas. I know what you’re thinking…. you might first look at these and say, “how are these enchiladas? Where are the tortillas? Where is the cheese?” When a girl is eliminating grain and dairy from her diet, she can still find a way to enjoy one of her all time favorite comfort foods. Which is why I decided to call this an “Enchilada Bake”. I’m super excited about sharing this recipe with you because of this crazy good flavor combination! 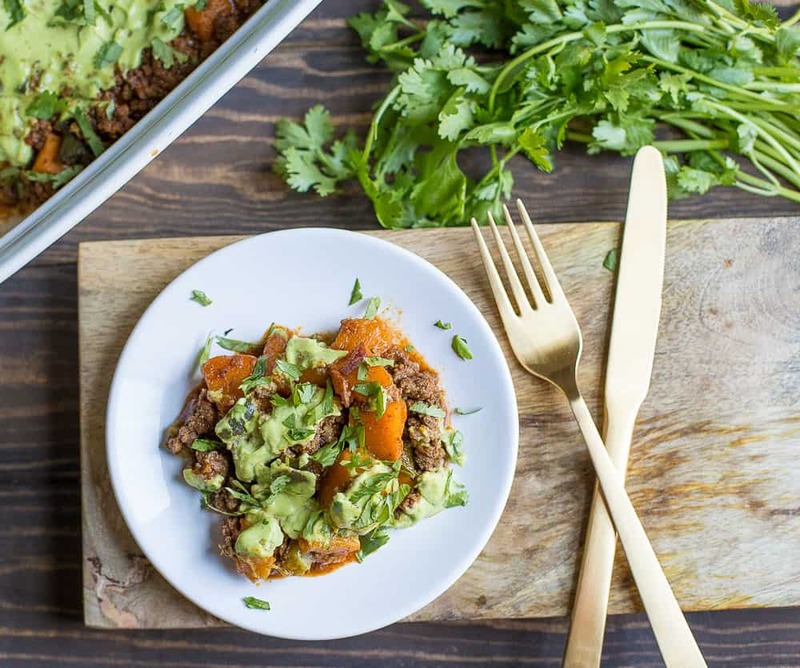 The roasted butternut squash give these enchiladas a nutty and sweet taste to balance out the spices and heat of the sauce and poblano peppers. The enchilada sauce is made with easy spices. 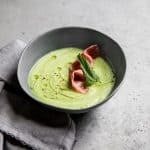 Finally, the entire dish is topped with a creamy cilantro avocado sauce that brings all the flavors together! I promise you won’t be missing the cheese, or even thinking of the tortillas. Of course, you can always add in the tortillas and the cheese if you feel inclined. For my kids, I wrapped up in a tortilla. One thing I love about this dinner, is the versatility. Feel free to swap out the beef for chicken, or even do a meatless option with portobello mushrooms. You can also use sweet potatoes in place of the butternut squash. This is not a meal I would file under the 30 minute or less category, but still comes together with simple ingredients. It makes a great Sunday dinner that will also give you leftovers for the week! Preheat your oven to 400 degrees. Grease a 9x13 casserole dish, and butternut squash and poblano pepper. Lightly brush 1-2 tbsp avocado oil or olive oil over veggies. Sprinkle with salt. Bring to oven and bake for 25-30 minutes or until veggies are softened and lightly golden. Remove from oven. Meanwhile, make the ground beef in a large saucepan. Heat to medium high heat, add a tbsp of oil and garlic once hot. Cook the beef stirring frequently until no longer pink. Set aside. While beef is cooking, make your enchilada sauce. Mix together arrowroot, chili powder, cumin, chipotle powder (if using), onion powder and salt. In a small saucepan, heat oil over medium high heat. Add garlic and saute 1-2 mins until fragrant. Turn heat down to medium low. Add spice mixture to the pan to form a paste. Now stir in broth, vinegar, and tomato paste. Heat to medium high and whisk while the sauce begins to thicken. Reduce heat once again, continuing to whisk for another 3-4 minutes. Set aside. Remove vegetables from the oven. Top vegetables with beef and enchilada sauce and mix well. Return back to the oven, lowering to 375. Bake for 10 mins. 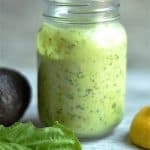 Now make the avocado cilantro sauce. Combine the ingredients into a food processor or blender. Blend until smooth. 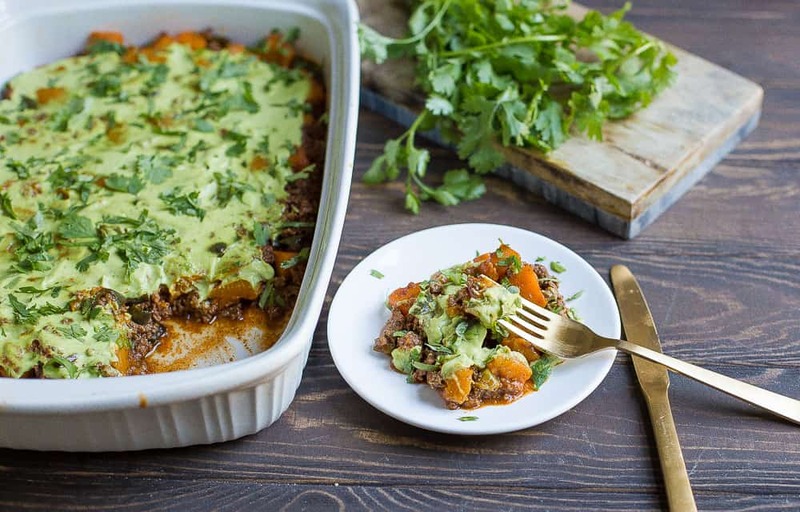 Remove enchilada bake from the oven. Let cool for a few minutes. 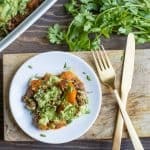 Top with avocado sauce, fresh cilantro, and any other desired toppings. Serve hot. Made this for super tonight – it was EXCELLENT! A little spicy for me, but my husband gobbled up 2 helpings!! Will cut down on the amount of Chipotle spice next time, but this is a keeper!! Thank you do much – real food, real GOOD! Yummy-O! 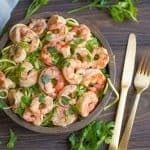 Are you sure 1 tsp salt is right for the avocado sauce? It was way to salty and not even sure the sauce needed salt since there was vinegar and lime juice. I use a full tsp, and haven’t had anyone say it was too salty. I can change it to 1/2 tsp, with adding in more to taste! This is one of my weekly favorites! I’m wondering how it would turn out if I tried making it in a Crock-Pot while I was at work. Any thoughts or have you tried this? I have never tried! Let me know if you do!